Whilst this sort of stand out promotion may not be unexpected, there have been some interesting things happening online. Robin Goad from Hitwise has studied the traffic patterns for Beatles searching visitors to the iTunes store. He found that in the UK news sites, particularly the BBC, led a fair amount of people to iTunes store, but perhaps the most interesting find is derived from his comparison of the contributions of Search vs Social Networks. 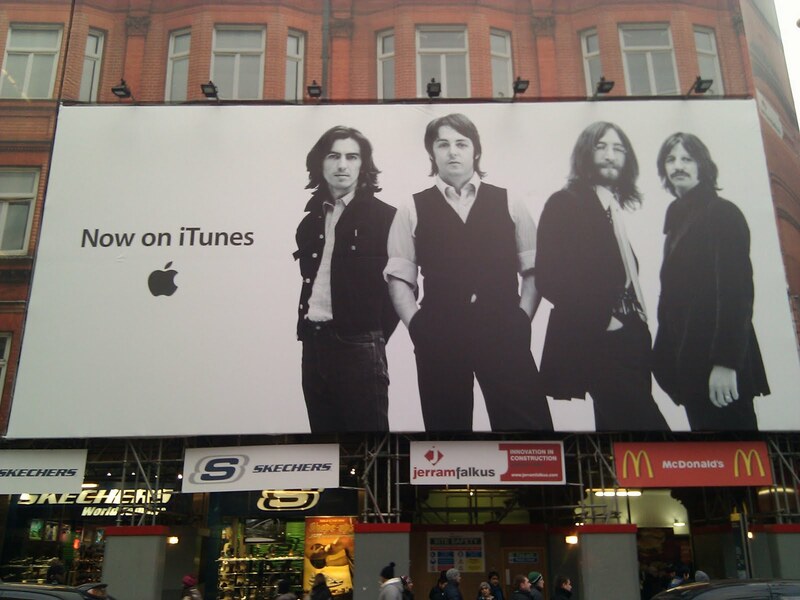 Hitwise data showed that on the day of release, 'despite paying for 67% of its traffic, Apple was only the ninth biggest recipient of traffic for the search term "the beatles."' Furthermore, 'on the day the Beatles content came to iTunes, 26.32% of all Apple traffic came from social networks', particularly from Facebook.